Yesterday marked the first installment of a new editorial column I will be writing on Artspace.com, entitled “On Trend.” I am so excited that Artspace asked me to write about the various crossovers between art and fashion, and it was only fitting that my first article (which you can read here) provide a brief history of art and fashion collaborations. 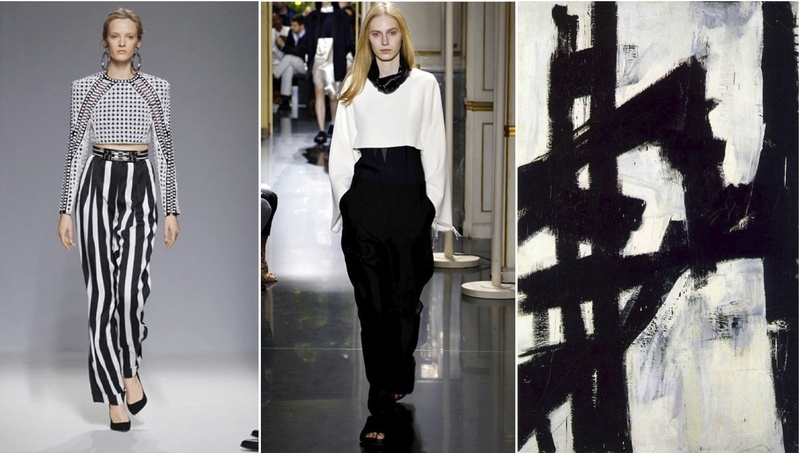 For today’s On Trend, and in honor of Mercedes-Benz Fashion Week, I pulled together a roundup of some of Spring’s chicest looks—and the artworks that echo them. Below, I expanded upon that theme. Happy New York Fashion Week!! After a year of color blocking and bold, bright hues, designers this season went back to the basics with mod looks in black and white. 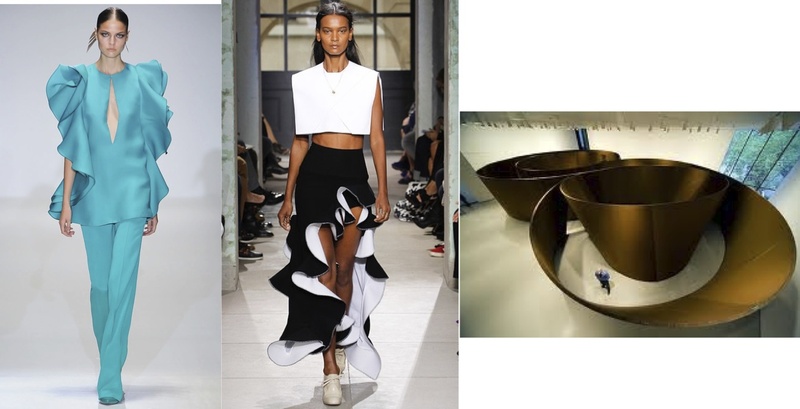 The midriff-bearing trend of 2012 has evolved into a new obsession with all-over cutouts this spring, with exposed patches of skin peeking out in almost every runway show. The ruffle—often used in sweet, demure ensembles—can be seen this season adding architectural flares and lots of impact to monotone looks. We now know that striples come in all shapes and sizes, with various iterations of this classic pattern highlighting a multitude of runway looks. 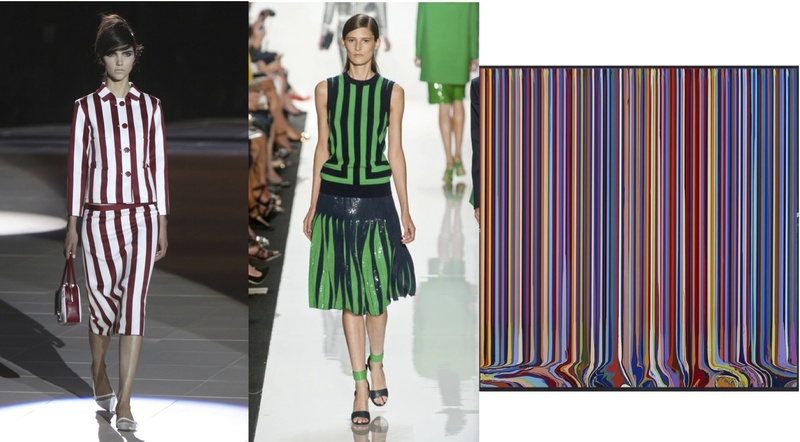 This season’s trend focuses on big, bold stripes for a statement look. Generally a summer staple, white is staking its claim early this year. 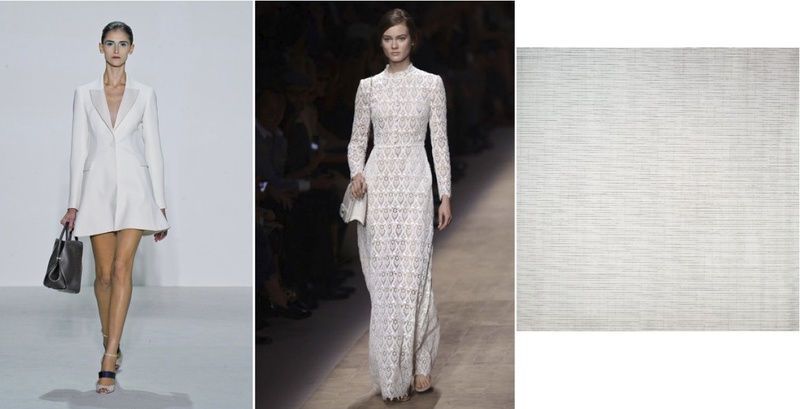 This season, the monochromatic neutral is appearing in all shapes and sizes, including structural dresses, menswear looks, and lacy-delicate fabrics. Pair it with a lucite heel, and your clean crisp look will be utter perfection. Neons are everywhere this season despite the fact that black and white continued its reign. The bright hues are lighting up both clothing and accessories—which is perfect for anyone hoping for an attention-grabbing outfit. 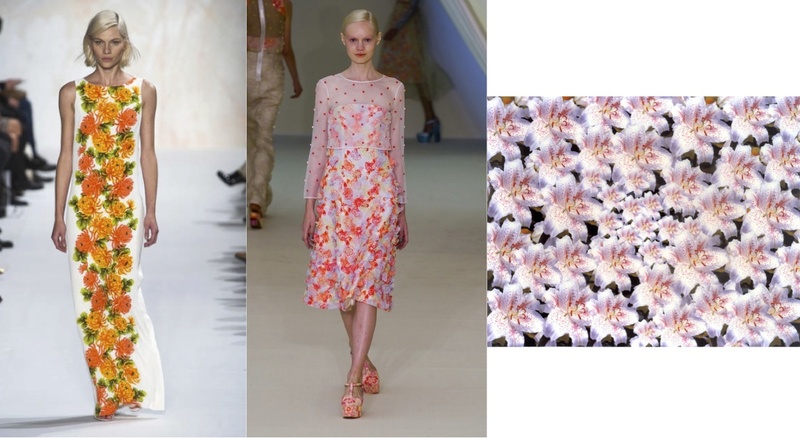 All things are blooming this spring, with the perennial favorite print making both a romantic and graphic revival. Raf Simons transformed his entire runway debut for Dior into a blossoming garden, with the walls of each room packed floor to ceiling with a different colored flower. Designers often look abroad for inspiration, but this season is ripe with influences from the Far East in terms of color palettes, patterns, and embellishments. Asian-influenced prints made their rounds this season, with bold reds as a central component. 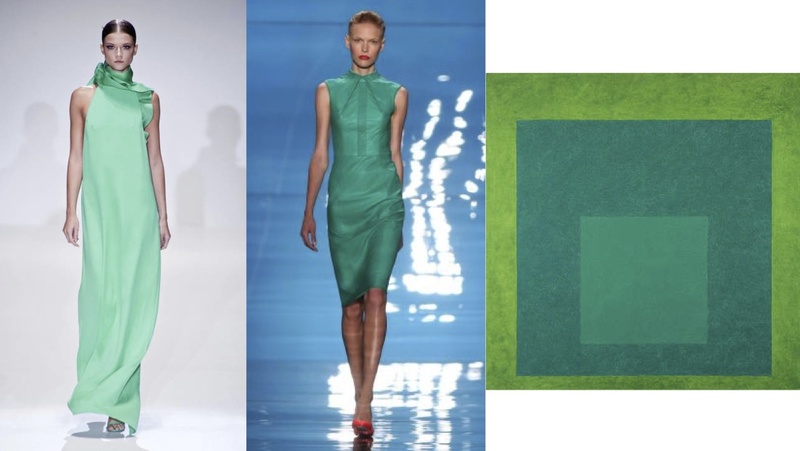 Pantone has labeled this jewel-like hue the 2013 Color of the Year, and the sartorial set has taken note, donning the shade of green from head to toe.